On an International Workers’ Day that’s dawned fine and clear here in London, I want to take a moment to celebrate the pivotal events of May on the occasion of their fiftieth anniversary. Let’s be crystal-clear that the struggles of May left us with a legacy that is by no means uncomplicated. More than a few of those who threw their bodies on the barricades then and in the months that followed shamefully spearheaded the turn to neoliberalism just a few years down the road, as the intellectual winds started to blow from a different quarter. The language and symbols of the moment have often been coöpted in the decades since, used to advance political and commercial agendas that would surely have struck the demonstrators at the Sorbonne (and their counterparts in Chicago, Prague, Mexico City and elsewhere) as obscene. Adding insult to injury, images of May are more than occasionally invoked by sentimental veterans of the left as a stick to beat younger activists with — taking them to task for not somehow bringing society to its knees in a matter of weeks every time there’s a new wave of dissent, as though the entire economic/sociotechnical/media milieu hadn’t changed a whit in the half-century since Danny the Red leapt the CRS fences. And yet, and yet. 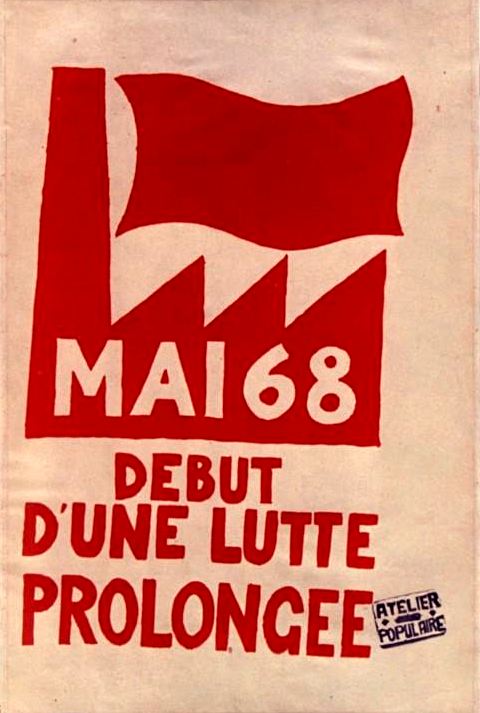 We (OK: I) return time and again to those indelible, iconic Atelier Populaire posters, and the images of Paris ripped up, barricaded, shrouded in a fog of war gas they so reliably conjure, for the pure hit of Situationist verve and sheer insurgent insouciance they offer, even at such a long remove. If there’s a task before us, it’s to ensure that those images live as channels of power from their moment to ours: that we avoid turning them into fetish, shrine for a dead and irretrievable vector of possibility, or worst of all, decor. If we use them properly, in fact, they’re a goad, a potent reminder that the impossible is still a thing that lays before us to demand, and to achieve. 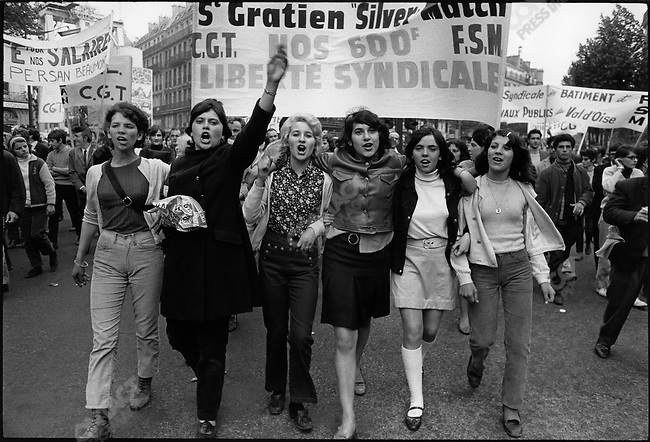 CGT-organized demonstration, Place de la République, Paris, France, May 29, 1968. © Fondation Gilles Caron/Contact Press Images.